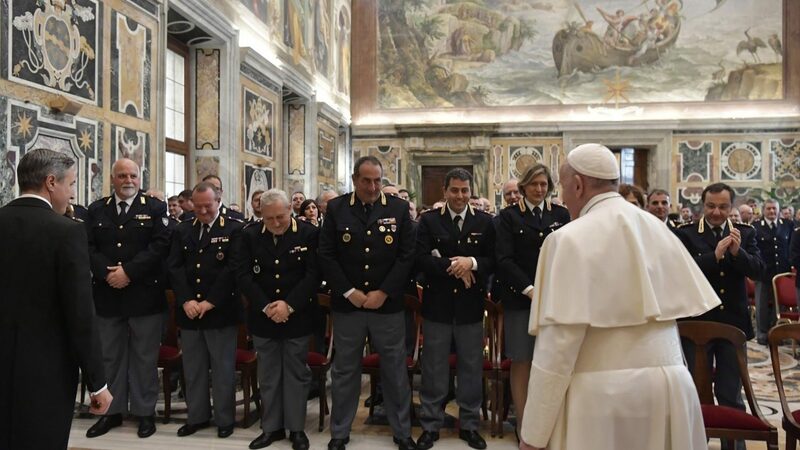 It is always a welcome appointment this meeting at the beginning of the year with you, representatives of the Inspectorate of Public Security at the Vatican. I welcome you with affection and respect, and I renew to all my deep gratitude for the commendable service you give daily to the Apostolic See and to the Vatican City. I thank the Chief of Police for the kind words he addressed to me on your behalf; I welcome and congratulate the Prefect Felice Colombrino and the Manager Luigi Carnevale, who have recently taken up their duties. And I greet each of you, formulating sincere wishes for a new year full of human and Christian values ​​that make life beautiful and fruitful. The festivities of Christmas and the Epiphany, which we have just celebrated, have given us the opportunity to meditate once again on the event of the birth and manifestation of Christ on earth. His coming among us reveals to us the unthinkable closeness of God to man and the immense love He has for us. His presence gives meaning to our life and stimulates us to hope, helping us to raise our gaze beyond the difficulties and problems of every day. At the same time, it leads us to charity, to live our relationships with a fraternal and merciful attitude, especially with those who suffer from sickness, abandonment and marginalization. The attitude of proximity to people is also typical of your work, and you have the opportunity to witness it every day. By vocation, you are close specialists. Thanks to your precious work of surveillance and public order, pilgrims and tourists - each with their own history - who from all over the world reach St. Peter's Basilica, are facilitated in their visit. It is commonly recognized your competence and wisdom in dealing with different situations, even the most critical; of this too I want to make you merit. Thank you so much for your professionalism and your generosity! I urge you to persevere and seek the best in your operational style, striving to welcome everyone with so much patience and understanding, even in those moments when you feel the tiredness or weight of unpleasant situations. Your daily service is designed to garrison St. Peter's Square and Vatican appurtenances day and night; you are on the spot with all weather conditions, favorable or adverse. When I think of your availability and your spirit of sacrifice, I am admiring and edifying, and also a bit 'of shame when I think of many people who say they are Christian and who are not up to your example. I can not forget, then, your effective collaboration in my pastoral visits to the parishes and other communities of Rome, as well as during my travels to other Italian locations. I am very grateful for all this. The Chief of Police also spoke of the sense of belonging: there is the danger of losing him in this society. You guard the Piazza, keep my travels, keep a lot of things, but I will ask you a favor: try to preserve the cultural roots of the city, of the country, of culture. This civilization has the danger of becoming "uprooted", and we know that without roots we do not grow, and "what the tree has of flower, comes from what it has to buried" (cf F. L. Bernardez, Para recobrar). And strive in this: to keep the roots, because the roots are those that give us identity. Our identity is that of today, but it comes from the roots, and will be transmitted to our children, our grandchildren, but always from the roots. Thank you for doing this. Dear friends, I entrust each of you to the maternal intercession of Mary Most Holy. You are always close to your work and support your families, to whom I address a special thought. I ask you to please pray for me; I wish you a happy new year and I cordially impart my Apostolic Blessing to you and to those dear to you.